Pope Francis said in an interview published on Thursday that the church may consider ordaining married men who could potentially then work in remote areas faced with a shortage of priests. “We must think about whether viri probati are a possibility,” Francis said referring to older, married men who are already involved in church business. “Then we have to decide what tasks they can take on, for example in remote communities,” he added in the interview with German weekly Die Zeit. Many in the church believe, given the lack of priests in many places, that a new path to ordination should be opened. Pope Francis said in May 2014 that “there are married priests in the Church” citing married Anglican ministers who joined the Catholic Church, Coptic Catholics and the priests of some Eastern churches. The church, and notably the current pope’s predecessor Benedict XVI, had previously said that celibacy was not a matter of inflexible church dogma unlike, for example, the resurrection of Jesus Christ. 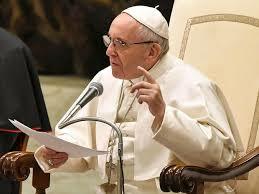 However, Francis said allowing priests in training to choose whether or not to be celibate was “not the solution”.